In an address to the nation with the theme “Choosing Greatness”, he also vowed once more to build a border wall. The Republican president called for political unity, hours after using an offensive term to describe the Democratic leader of the US Senate. In a rebuttal, Democrats will accuse Mr Trump of abandoning US values. Mr Trump’s primetime address follows the longest US government shutdown in history over border security. He provoked the crippling closure of federal agencies by demanding funding for a US-Mexico border wall only to backtrack when Democrats flatly refused. Mr Trump said he would meet Kim Jong-un in Vietnam from February 27-28. Plans for a second summit have been in the works since the two leaders’ historic talks last year. Mr Trump and Mr Kim’s meeting last June in Singapore was the first ever between a sitting US president and a North Korean leader. On Tuesday night, Mr Trump said: “Our hostages have come home, nuclear testing has stopped, and there has not been a missile launch in 15 months. “If I had not been elected president of the United States, we would right now, in my opinion, be in a major war with North Korea. What did he say about political unity? After two years of toxic partisanship, Mr Trump on Tuesday night repeated calls for political unity that he has made in his last two annual speeches to Congress. “Together, we can break decades of political stalemate,” he said. But in an apparent reference to Democratic accusations that his campaign colluded with Russia during the 2016 election campaign, he said “ridiculous partisan investigations” were holding back US economic progress. Hours before the speech, Chuck Schumer, the Democratic leader of the Senate, poured pre-emptive scorn on Mr Trump’s remarks. In a private lunch with news anchors at the White House on Tuesday, Mr Trump called Mr Schumer “nasty”, using an offensive term, reports the New York Times. The president was also quoted as having called former US Vice-President Joe Biden, a potential White House challenger in 2020, “dumb”. As Mr Trump delivered his primetime speech on Tuesday, his chief congressional antagonist was sitting at the rostrum over his shoulder. The Democratic leader of the House of Representatives, Speaker Nancy Pelosi, led congressional resistance to the president’s demands for wall funding and regularly mocks him. Stacey Abrams, who lost her race last year to be governor of Georgia, will deliver the Democrats’ response to Trump, making her the first African-American woman to deliver the party’s rebuttal. 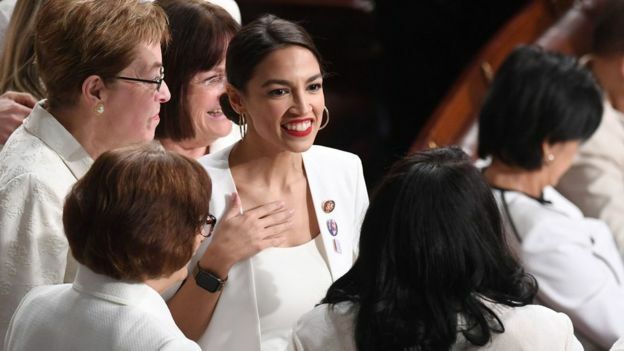 A number of Democratic female lawmakers were wearing white, the colour favoured by early 20th Century suffragettes. For most of the speech, they sat stony-faced as their Republican counterparts got to their feet for the applause lines. But in a rare outbreak of bipartisanship, Mr Trump received a standing ovation from Democratic female lawmakers when he said there were more women in the workforce and in Congress than ever before. The president vowed again to build wall on the border, pointing out that many lawmakers had previously supported such a barrier. But with another government shutdown deadline looming next week, the president has few options for getting Congress to fund a border wall. He did not declare a national emergency instead on Tuesday night, in an attempt to get around lawmakers and fulfill his signature campaign promise. Mr Trump told his audience that working class Americans pay the price for illegal immigration. He pointed to a guests in the audience, a woman whose parents he said had been killed in Nevada by “an illegal alien”. “Not one more American life should be lost because our nation failed to control its very dangerous border,” said Mr Trump. Mr Trump said he would press ahead with plans to end US involvement in conflicts in Syria and Afghanistan. The president said “virtually all” of the territory once occupied in Syria and Iraq by the Islamic State group had been liberated from “these bloodthirsty monsters”. “It is time to give our brave warriors in Syria a warm welcome home,” he said. Mr Trump said his administration was holding “constructive talks” with the Taliban to find a solution to the conflict in Afghanistan. “The hour has come to at least try for peace,” he added. “Great nations do not fight endless wars,” said the president, who campaigned on an ‘America First’ platform. Next Mustafa Hameed writes: HISTORY OF BY-ELECTION AND ELECTION RELATED VIOLENCE IN GHANA!